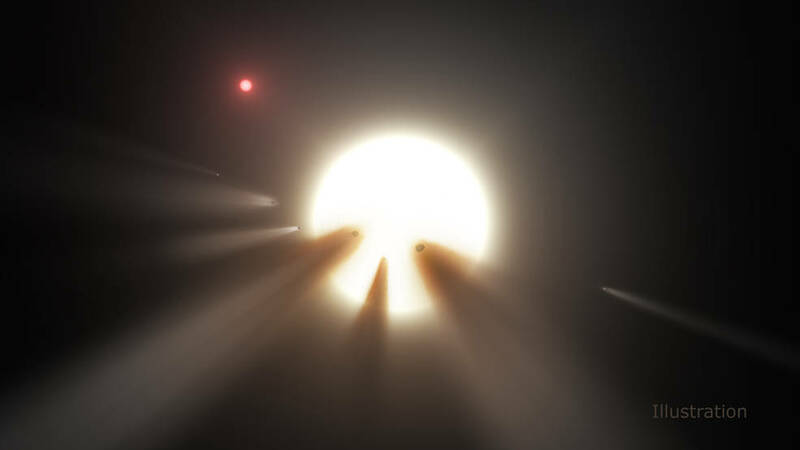 November 24, 2015 – A star called KIC 8462852 has been in the news recently for unexplained and bizarre behavior. NASA’s Kepler mission had monitored the star for four years, observing two unusual incidents, in 2011 and 2013, when the star’s light dimmed in dramatic, never-before-seen ways. Something had passed in front of the star and blocked its light, but what? A new study using data from NASA’s Spitzer Space Telescope addresses the mystery, finding more evidence for the scenario involving a swarm of comets. The study, led by Massimo Marengo of Iowa State University, Ames, is accepted for publication in the Astrophysical Journal Letters. At first, researchers tried to look for infrared light using NASA’s Wide-Field Infrared Survey Explorer, or WISE, and found none. But those observations were taken in 2010, before the strange events seen by Kepler — and before any collisions would have kicked up dust. “Spitzer has observed all of the hundreds of thousands of stars where Kepler hunted for planets, in the hope of finding infrared emission from circumstellar dust,” said Michael Werner, the Spitzer project scientist at NASA’s Jet Propulsion Laboratory in Pasadena, California, and the lead investigator of that particular Spitzer/Kepler observing program. But, like WISE, Spitzer did not find any significant excess of infrared light from warm dust. That makes theories of rocky smashups very unlikely, and favors the idea that cold comets are responsible. It’s possible that a family of comets is traveling on a very long, eccentric orbit around the star. At the head of the pack would be a very large comet, which would have blocked the star’s light in 2011, as noted by Kepler. Later, in 2013, the rest of the comet family, a band of varied fragments lagging behind, would have passed in front of the star and again blocked its light.